posted by Billie Owens in animal rescue, volunteers for animals, pet adoption, Genesee County Animal Shelter. This information is from the newsletter of the Volunteers for Animals at the Genesee County Animal Shelter. They encourage everyone to give the gift of health and compassion for homeless and needy cats and dogs by donating money, food and/or supplies to the shelter. And consider bringing home a new BFF by adopting a pet today. Just in time for the holidays, you could give a forever home to a forever friend. 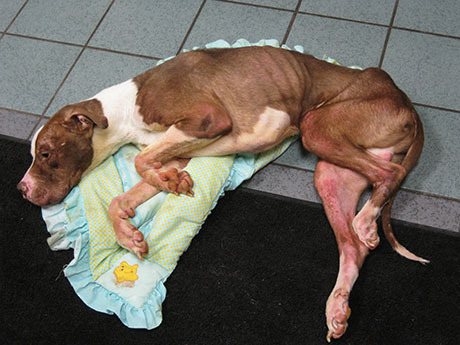 A scrawny, hairless dog was brought to the Genesee County Animal Shelter by the woman who found him lying in the road. She stopped and helped this oozing, smelly, weak dog into her car. That alone is amazing but she continued to visit him at the shelter right up to the day he was adopted about six weeks later. "Mike" had a terrible case of mange and a skin infection. He was very underweight and bony. His skin was bright red, oozing and itching constantly. He was taken to the vet and started on medications for the mange, the infection, and the itching. He was bathed regularly and put on a special diet to gradually increase his weight. It wasn't long before little patches of fur began to grow in. Mike gained weight and started to show interest in his surroundings and in the volunteers who cared for him. His rescuer visited at least two or three times a week. She walked him and brought him special treats. He loved visiting with her and always wanted to check her pockets to see what she had brought for him. Mike had a bout of stomach problems and needed further treatment but within a week or so he was back to normal and enjoying his walks again. Mike's new fur came in soft and shiny and by the time he went home his coat was almost perfect. The volunteers spent a lot of time with Mike, walking and playing with him. He was always a gentleman, polite with other dogs and gentle with every person he met. Mike's rescuer couldn't adopt him but she brought a few potential adopters to meet him. In the end it was Mike's patience and good nature that made the difference. He found his person. There was a celebration at the shelter when Mike finally walked out the front door to go home and his rescuer was there to share the big moment along with the volunteers. What a lucky dog! How many cars must have passed Mike while he laid on the road before this wonderful, compassionate woman stopped and scooped him up off the road. "Lucky" is a 14-year-old cat that was brought into the Genesee County Animal Shelter because her family had no place to live that would allow animals. She had been theirs for 14 years. They said she was a very sweet cat who loved having her belly rubbed. Lucky was tested for FIV/FeLV, which was negative, and given her vaccines. She was not spayed so the issue was debated and volunteers consulted with a vet. She did great with the surgery. Finally, she was available for adoption. They knew it would take a very special person to adopt this very special kitty but we were patient. Her story was posted on Facebook, which got over 2,500 views and 30 shares! They were hopeful. After a couple of weeks, there was an opening at Petco and someone suggested Lucky go there to try her luck. They packed up her favorite bed and got her settled at Petco. With little time to settle in, someone came along and fell in love with her. They put their application in for review. As luck would have it, the person was a resident of a local group home. The manager of the home spoke highly of the resident and she was immediately approved. No one could imagine a better place for Lucky. Word is that Lucky has settled right in and gets along great with all the residents. And best of all she is a part of their family now! So far in 2015, Volunteers for Animals have spent more than $70,000 on vet care, tests, vaccines and medications. They paid for: orthopedic surgery on a lab with a badly healed fracture; provided heartworm treatment on a sweet lab girl; covered the cost of a C-section on a mama dog who was having trouble birthing her puppies; provided dental care for a JRT with a mouthful of rotten teeth; and did treatment for possible parvo on a little pit puppy. A local vet reached out to take over rehabilitation of a cat that had such a badly infected bite wound that they had to surgically remove part of her shoulder; she recovered and was adopted. Numerous cats and kittens came into us suffering from dehydration, diarrhea, fleas, worms, bite wounds, eat mites or infections, and upper respiratory infections. More than 100 kittens too young to be adopted went into loving foster homes until they were big enough to be spayed and neutered prior to adoption. All of the animals adopted out of the Shelter left with vaccines, deworming and flea treatment, and were spayed/neutered. These are just some of the things donations go toward for the animals that come through the doors of the Genesee County Animal Shelter. Last year, 523 dogs and cats were spayed and neutered. This year, they are on track to do even more. Also, they have started to provide assistance to the community for the spaying and neutering of pets. After receiving a substantial donation at the end of 2014, they started a Community Spay/Neuter Program. In partnership with local vets, they are now providing low cost spay/neuter for pets to the local community. So far this year, more than 230 families got their cat or dog spayed/neutered thanks to the new program, as well as vaccinated against rabies and other deadly viruses. In August, they were awarded a grant for $20,000 from the ASPCA to provide low-cost spay and neuter of dogs and cats belonging to NYS residents who receive public assistance. The grant, via a voucher system, will cover the spaying or neutering of the pet, a rabies vaccine, a distemper vaccine and deworming. They hope to help close to 250 animals with the grant. They are committed to reducing the population of “unwanted” dogs and cats in Genesee County and are asking for your help and support to continue this important work. Volunteers For Animals is a 100-percent volunteer 501(c)(3) nonprofit organization that assists the Genesee County Animal Shelter, making possible efforts that cannot be achieved via the County’s operating budget. Your charitable gift is tax deductible and goes directly toward saving lives and providing comfort to the animals that depend on us. To learn more and to donate, visit the Volunteers for Animals on the Web, or mail a tax-deductible contribution, payable to Volunteers for Animals, to this address: Vol.unteers for Animals, P.O. Box 1621, Batavia, NY, 14021. Visit the shelter during visiting hours to meet potential furry companions, and to drop off much-needed cat and dog kibble, canned food, cat sand, paper towels, cleaning products, etc. posted by Billie Owens in volunteers for animals, rescue animals, Genesee County Animal Shelter. The 12th annual Fur Ball to benefit the Volunteers for Animals -- Spay/Neuter Program will be held starting at 6 p.m. on Saturday, Oct. 24, at the Days Inn in Batavia, located at 200 Oak St. And your donations of NEW items for the auction are still being accepted! Next Saturday, expect great food, lots of fun, quality auction items and some surprises, too! Tickets are $25 each, but $50 if purchased the day of the event. Children 12 and under pay $15. A table of 10 seats is $250. Only 200 tickets are available. Make checks payable to the Volunteers for Animals -- Spay/Neuter Program. Sunday, Monday, Tuesday and Friday -- 1 to 3 p.m.
Wednesday -- 1 to 3 p.m. and again from 7 to 9 p.m.
posted by Wendy Castleman in shelter, Genesee County Animal Shelter, dog, cat, volunteers for animals, animal. PETCO will be offering photos with Santa. Volunteers For Animals will be assisting and will receive proceeds from each photo. So pack up your pet and bring them out for a photo with Santa and help support the animals at the Genesee County Animal Shelter. posted by Wendy Castleman in shelter, Genesee County Animal Shelter, dog, cat, volunteers for animals. posted by Wendy Castleman in shelter, Genesee County Animal Shelter, rescue, dog, cat, volunteers for animals. posted by Wendy Castleman in fundraiser, Genesee County Animal Shelter, volunteers for animals. posted by Billie Owens in Genesee County Animal Shelter. The Genesee County Animal Shelter in Batavia is currently full of some of the best cats in the county. Kitten season should be winding down but according to the number of available cats and kittens at the Shelter it is still in full swing. All cages are full and there are many phone calls each day requesting space for more cats to come into the Shelter. As a result, we are offering all felines at half price - $20. All of the cats and kittens have been tested for FIV/FeLV, vaccinated for rabies and distemper, dewormed, treated for fleas and most have been spayed/neutered. Those not yet spayed/neutered require a $35 deposit refundable upon proof of surgery. We have adults and kittens in all colors, shapes, sizes and personalities. This back to school special will not last forever. It will only be available through Sunday, Sept. 14. Shelter hours are Sunday, Monday, Tuesday, Wednesday and Friday 1-3 p.m.; Wednesday 7-9 p.m.; and Saturday 11-1 p.m. Please support your local animal shelter and come out and adopt a new friend today. posted by Howard B. Owens in batavia, animals, Genesee County Animal Shelter, pets. Some of the shelter volunteers call him "Boyfriend," which tells you something about how "Foxer" has won the hearts of the people who care for him every day. The white and brown pit bull is sweet, kind and gentle and gets along well with the other dogs and people he meets. The only serious issue for Foxer these days seems to be a question of how much longer he's going to be confined at the Genesee County Animal Shelter. Foxer, also known around the shelter as "Skully," is caught in a legal battle between his owner, Nina Kelso, and the government that is prosecuting her for allegedly mistreating him. Kelso's case has been pending in Batavia City Court since Feb. 4 when she was charged with torturing or injuring an animal; failure to provide sustenance; and owning/harboring an unlicensed dog. The 29-year-old Batavia resident had another court appearance scheduled last week, but as with her previous court appearances, her case was continued, so Foxer's fate remains unresolved. According to Batavia's Animal Control Officer James Sheflin, Kelso won't sign Foxer over to the shelter so he can be adopted, and since Kelso's case is still pending, the shelter has no choice but to keep him confined. He can't even go to a foster home because he's considered evidence. Until his status changes he has to remain in the supervision and custody of the shelter. And he's getting a little stir crazy. During those hours he's confined to his cage, Foxer doesn't do much other than spin in circles. "In the kennel I think he gets a little bit of anxiety, but as you can see, as soon as he gets around humans he's happy and ready to go," Sheflin said. "I can't speak to how he was before we got him, whether he had a lot of human contact before, so I don't know if it's a separation-anxiety type thing." Volunteer Brenda Cromwell said Foxer is walked daily and even gets a car ride from time to time, but still he spends about 23 hours a day in his cage. Healthwise, he's doing much better. When he first came into the shelter (see picture below), he weighed 49 pounds. Today, he weighs 75 pounds. He was treated by a vet for gastroenteritis. "He is food-obsessed and looks forward, anxiously, to his next meal," Cromwell said. Another dog brought to the shelter a couple of weeks before Foxer was Nessa, owned by Lauren K. Pellegrino. Pellegrino's case, like Kelso's, is still pending, so Nessa remains confined to the shelter, but has adjusted to shelter life better than Foxer. Nessa displays no anxiety issues, but is as comfortable and happy around people as Foxer. Photo of Foxer taken Feb. 4. Nessa, above, today, and below, when she was first brought to the shelter. Donations are needed for a garage sale in Corfu June 12 - 14 to benefit the Genesee County Animal Shelter. It will take place on those dates from 9 a.m. to 4 p.m. at 60 E. Main St., Corfu. Any donations are welcome EXCEPT CLOTHING. Drop off donations at the county Animal Shelter anytime, and if the shelter is closed, leave them by the front door under the roof. The county shelter is located at 3841 W. Main St. Road in the Town of Batavia. The nonprofit group Volunteers for Animals is trying to put together a list of local homes willing to take in barn cats. From time to time, they get cats that would not fit well into a home as pets, and are most likely part feral. All cats are vetted, spay/neutered. If you are able to take in one or two, please let them know. It would really help them out in a crunch. posted by Billie Owens in Announcements, Genesee County Animal Shelter. Pet portraits to benefit the Genesee County Animal Shelter will be offered from 11 a.m. to 3 p.m. this Saturday, Dec. 1, at the USA Bird Supply, 11163 Main Road, in Clarence. Come and get a photo of your pet or you with you pet for only a $5 donation, which will go to animals in the local shelter. Volunteers For Animals is sponsoring the event in conjunction with USA Bird Supply and Jay Terkel Photography. Volunteers for Animals is collecting scrap metal to raise money for animals at the county shelter. The collection drive is from 11 a.m. to 3 p.m. this Saturday and Sunday (Oct. 27-28) at the shelter parking lot, 3841 W. Main St. Road, in the Town of Batavia. They CANNOT take: propane tanks, air-conditioners or refrigerators. The scrap service is being provided by Ed Arnold EAS Scrap Processors in Corfu. We need help with food! With all the poodles we rescued recently, we are in need of small dog kibble. Some are missing teeth and they all have small mouths so we are in desperate need of small dog kibble! It is that time of year again and we find ourselves needing dry kitten food to feed our many growing kittens in foster care and those starting to return for adoption at the shelter and Petco. The community has been good to us in the past and we hope we can count on you again to donate dry kitten food to help all our cute kittens grow up healthy and strong! Please drop it by the shelter during adoption hours. The Genesee County Animal Shelter is located at 3841 W. Main St. Road in the Town of Batavia. A big, three-day garage sale is planned by Volunteers for Animals, with all proceeds going to benefit the animals at the Genesee County Animal Shelter. The sale will be held at 54 River St. in Batavia from 9 a.m. to 4 p.m. on Thursday, Friday and Saturday June 14-16. Bring in your empties and we will return them for you. Or you can take them directly to Rob’s Bottle and Can at 214 Ellicott St. in Batavia (Hours are M-F 9-5 and Saturday 9-2) OR Eastown Beverages on East Main Street in Batavia. In Le Roy, Le Roy Redemption Center at 8 1/2 Lake St. (Route 19) will accept empties for VFA. Just tell them that they are for Volunteers For Animals and they will do the rest! All of the money collected from the deposits will go directly toward helping the animals at the shelter. Carlson's Studio Photography is once again offering to take a picture of you and your pooch -- or other pet -- to benefit animals. The business, which recently closed its Batavia office and now operates only at its Wyoming location, will donate the $20 sitting fee to a worthy animal cause of your choice during this special by-appointment-only offer. Pet Portrait Days are Friday and Sunday, March 9 and March 11. The Genesee County Animal Shelter, for example, is one of the places which would benefit if you mention Volunteers for Animals, the local group which helps dogs and cats at the shelter. The group gets $20, you get a high-quality 5X7 photograph. "Great pics for a great cause." posted by Wendy Castleman in Genesee County Animal Shelter, volunteers for animals, pet adoption, Wendy Castleman's blog. posted by Wendy Castleman in adoption, shelter, Genesee County Animal Shelter, rescue, dog, cat, volunteers for animals, kitten, puppy.